Once upon a time, I added an amazing book to my Christmas gift wish list. “1000 Artist Journal Pages” is a feast for the creative spirit. It is beyond eye candy but can certainly entertain and tantalize your visual senses. Not long before that book was unwrapped and added to my shelf, I began following the talented Dawn DeVries Sokol on Twitter @dawndsokol. Meeting published artists makes me giggly and a bit nervous, even through the computer. Dawn is an awesome person to chat with and her website is amazing. Needless to say when she said her new book “Doodle Diary: Art Journaling for Girls” was coming out I knew I had to have it. When a copy showed up from the publisher to review on this blog, I did a little happy dance. Okay so it wasn’t so little but you needn’t get the entire picture of that. 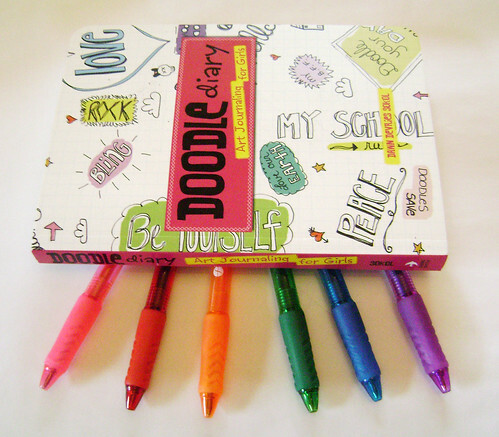 The Doodle Diary is a convenient sized book. At 5.25 by 7.25 inches and a half an inch thick, it is portable and ready to join you anywhere for an adventure. 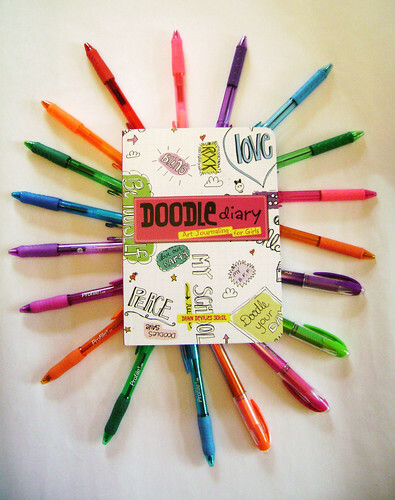 The cover is attractive and eye catching, ripe with Dawn’s doodle-icious artwork. If the cover tickles your fancy, just wait until you peel it back to reveal the pages inside. They are vivacious and invigorating. Dawn has made this a “anti-block” art journal. Creatives get “the block” often. Our creativity backs up and things coagulate and get stuck. It becomes a struggle to even touch a pen tip to paper. Some times we break out in cold sweats or even develop a nasty facial twitch but this book alleviates this. I can see artists using this book to keep the creative juices flowing freely. 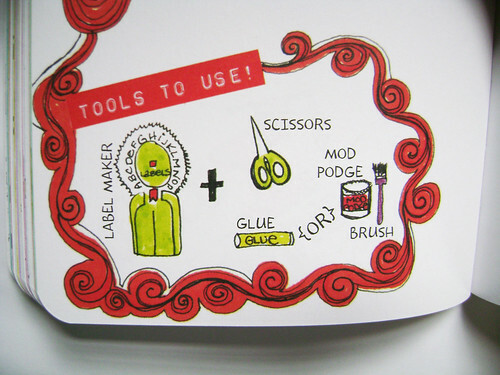 Each spread of pages has prompts, tool tips or Dawn’s jump-start artwork. I would love to see someone with a severe enough blockage to resist the powers of this book. Seriously I would – and then I will take you to a doctor to see about getting it removed – surgically. This book is aimed at girls. The name says it. I am going to say Bah! to that and encourage everyone to pick up a copy. So you’re a guy? Big deal. Collage over the cover and no one will know. Name it “The Manly Man Man Book” and no one will care. Are you too much of an adult? Poo on that. Everyone can use a little play time in their lives. Keep it next to your bed and before you go to sleep, grab a colored pen or marker and let your internal child have some fun. Can’t draw? I have heard this a million times. Grab a pen and make a shape. Now give that shape a face. Like stick figures? So did Picasso! Don’t judge yourself – let the pen take you where it may and then if you don’t like it, blame the pen. (I do it all the time). I don’t want to ruin the surprise of turning the pages of this book. I want you to experience the “flash” of what comes to mind first when you read the prompts. I think this is entirely too awesome of an experience with this book. It’s like opening a can of soda pop (which I don’t do anymore because I gave up soda but since I miss that sound and feeling I’ll use it for this analogy). I love being able to pick and choose what page to work on next. Bouncing back and forth is encouraged I’m sure! Here is a shot of one of my favorite Dawn-Doodles in this book. 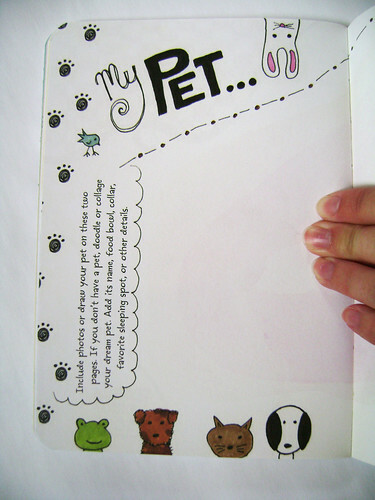 You all know how many pets I have so this spread is going to fill up fast. Reminding yourself of all the things you have to be happy about is a very beneficial practice. What a great trigger! Art journaling is something everyone should at least try. 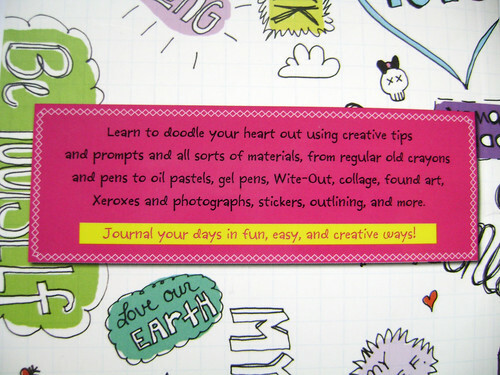 Its a great creative way to express yourself and if you’re not sure about tackling a blank sketchbook or you want a portable companion, give Dawn’s book a try.